Jason Ward is a tattoo artist at the Muscle and Ink tattoo parlor in New Zealand. He's seen all sorts of different customers come into the shop, but none like Suzie. One Friday, she walked into the shop, placed a pile of temporary tattoos on the front desk, and said, "Put these on my arm." He thought her request was a bit silly, but he knew that only a few minutes of kindness would make a huge difference in her day, so he obliged. Jason's kindness did make a huge difference. 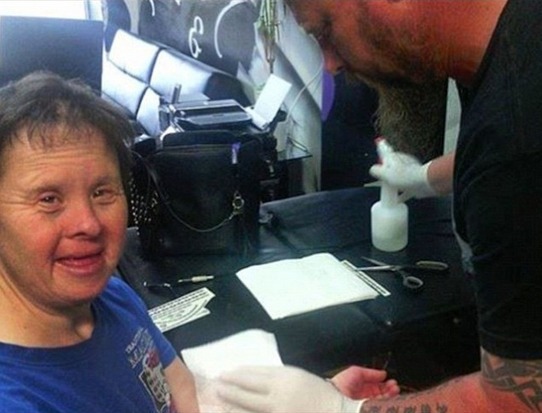 Every Friday, Suzie comes back for more tattoos from Jason. Suzie loves her temporary body art, and after her visit to the shop she goes her care facility and shows off her new designs. It's the highlight of her week, and maybe Jason's too. It only takes a couple of minutes of your time to make someone else's life just a little better. We need more caring people like Jason in this world. Share this sweet story with your family and friends!